Thematic investing has gained popularity in recent years due to its relatable ideas based on changes happening around us. After all, change has been the only constant across centuries in our ever dynamic world, and thematic investing makes these ideas investable for the retail investors. One such theme is identifying & investing in popular brands. Brands often start as a mere company name or logo, but they end up becoming multi-billion dollar assets! That’s because over time, the simple name/logo starts representing characteristics that we humans value a lot – trust, great service, high quality, innovation, etc. For example, the ‘Apple’ brand, which started out as a young/rebel challenger to Microsoft is now often associated with premiumness/quality & innovation – and it’s brand is worth an astonishing $300 billion today! Once a company becomes a brand, more & more people who value the particular traits start getting attracted to the brand (and hence the company’s products). This becomes a “virtuous-cycle”, and it usually takes a major negative shock for a brand’s value to significantly decline (think Satyam or Gitanjali). In a country like India that only started its economic revolution few decades ago, existing brand perceptions matter even more. As the average income increases, people look to increase their spending – and the already popular brands tend to benefit from this trend the most. India has numerous such brands. While many are synonymous with their company names – like HDFC Bank, Reliance Industries, or Tata Motors – there are still many popular brands that are either owned or operate in a partnership with an Indian public listed company. For example, the jeweller Tanishq is owned by Titan Industries, popular beer brand Kingfisher comes from the listed United Breweries, the iconic motorbike Royal Enfield is the crown jewel of Eicher Motors, and so on. These companies are often seen to command a share price premium over their industry peers, a common measure of which is the P/E ratio – comparing the stock P/E with the industry P/E gives an idea of how much the market values the company vs. the average industry for the same level of earnings. 2-year Average premium for some such brands are highlighted below (data as of December 2018). Investing in listed firms that have already created a brand for themselves can be a rewarding investing strategy – which is why we’ve created a portfolio of such companies. The Brand Value smallcase includes firms like Hindustan Unilever, ITC, Indian Hotels, INOX, Marico, etc. – companies which own brands that have either become synonymous with the product (e.g. Surf is interchangeably used for washing detergent or Titan is synonymous with watches) or which have created a niche of their own in their industry (e.g. Royal Enfield or Tanishq). This Brand Value smallcase has increased by a healthy annualised return of 22.72%. 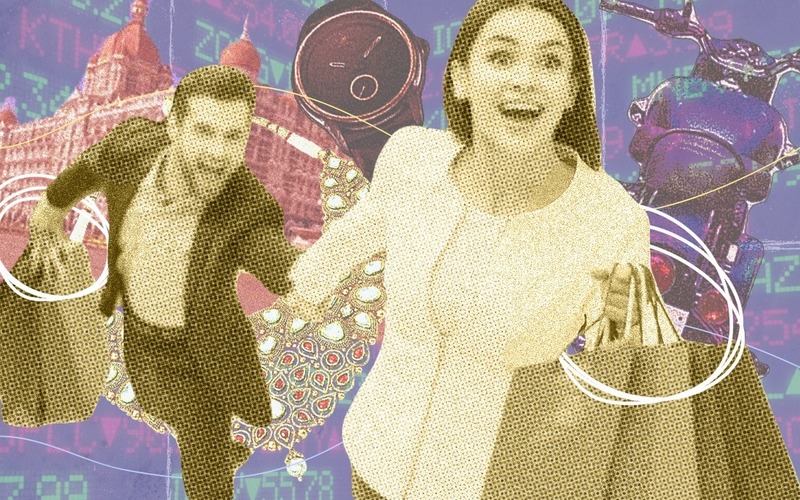 Consumption is an important theme in India, and it will be especially prevalent in 2019 due to the forthcoming elections – and getting exposure to this theme by investing in companies that own premium brands can be a winning strategy.